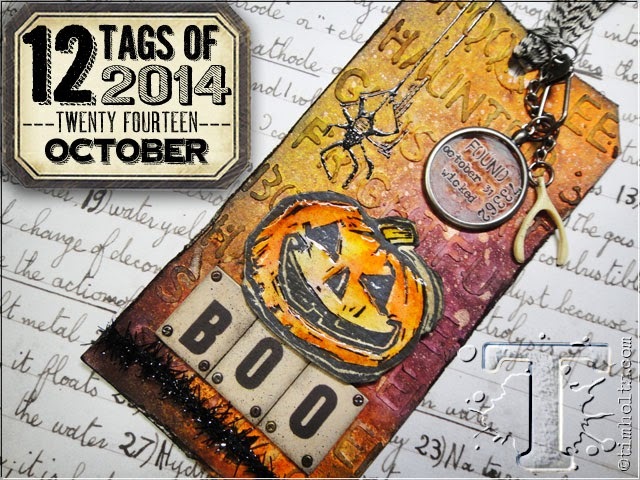 I finally made my October Tim's Tag - I knew exactly what I wanted to do with it - but couldn't seem to find the time to sit down and do it! And below is my version. I used black embossing paste on the Halloween Stencil. I also dabbed on Distress Stains - not having any of the new Distress Stain Sprays yet - so the colors look much brighter - I also forgot to mist the tag with water before staining - so that probably had something to do with it as well! But I like the result! Instead of a stamped pumpkin and spider - I used the Candlelight Fright die for my spooky candlestick and spider. When I was moving around the BOO Alpha Chips to see how they could fit on the tag - I realized it looked like the spider was grabbing the first O when I moved it up a bit, so that's how I placed it. I colored the rope of the Tinsel Twine with a black marker since I didn't have the black tinsel. I embossed the spider with Watering Can and a sprinkle of Tree Branch Embossing Powders and then rubbed some Clear Rock Candy Distress Crackle on him. I added 2 orange rhinestones for eyes. I added dots to the corners of the letters with a Black Glaze Pen. I embossed the base of the candlestick with Wendy Vecchi Watering Can embossing powder and the flames with Tree Branch embossing powder. I rubbed some dried up Snowcap Adirondack Acrylic Paint on the candles - (it was really thick being dried up!) - then I rubbed some Clear Rock Candy Distress Crackle paint over them and let them dry. I added 2 Remnant Rubs/Apothecary on the candlestick. Then I rubbed over the whole thing with Vintage Photo Distress Ink. I added the Monocle with Remnant Rubs on the front and white distress paint on the back and attached it to the trimmings with a Wire Pin. 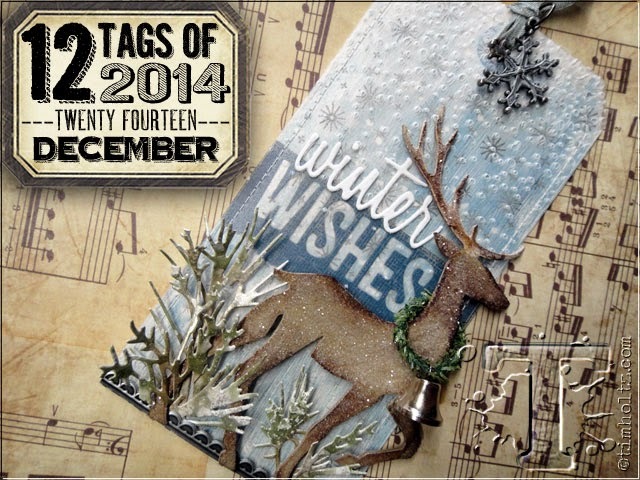 I layered my tag to a slightly larger tag cut out of Smokey Shadow card stock and called it done! You'll find lots of tags linked up over at Tim's post - are you making one? You have until Oct 31st! Ink: Wendy Vechi Archival Watering Can and Tree Branch, Ranger Distress Vintage Photo. Accessories: Idea-ology - Monocles, Alpha Chips/Elementary, Wire Pin, Remnant Rubs/Apothecary, Tinsel Twine, Jute String, Trimmings Naturals/Black/Cream; Clear Rock Candy Distress Crackle - Ranger, Candlelight Fright Die - Alterations/Tim Holtz/Sizzix, Black Sharpie, Black Glaze Pen- Sakura, rhinestones - Kaiser Craft, Ranger Distress Stains - Picked Raspberry, Marmalade, Salty Ocean, Halloween Stencil - Tim Holtz, Wendy Vecchi Embossing Powders - Watering Can and Tree Branch, Wendy Vecchi Black Embossing Paste. 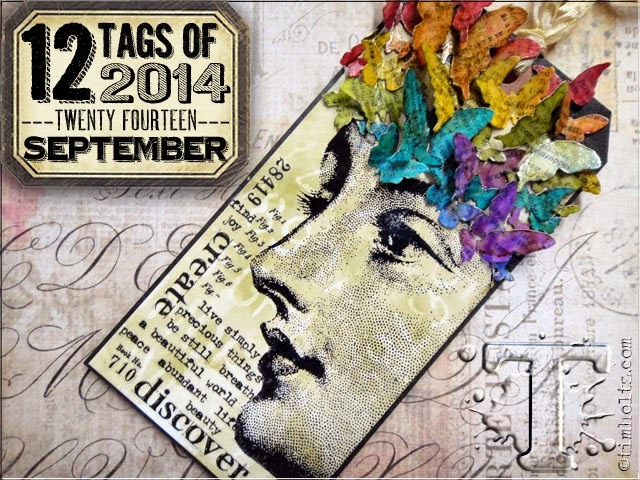 I've been playing along with the Tim Holtz 12 Tags of 2014 - and here is my tag for Sept. I used leaves instead of butterflies and a face stamp from Face in the Crowd by Dina Wakley. I looped some Jute String through the hole in the tag. I had quite a bit of trouble trying to recreate his technique for the background - and after 5 tries - this final effort was the best I could get of it. Here is his tutorial for the tag he created. You use Alcohol Blending solution on a stencil on Ranger glossy card stock - then drag the piece through some light colored Alcohol ink squirted on a craft mat - and you are supposed to be able to see the stencil design sort of like a resist. This is Tim's tag below. I used the Christmas Stencil (which is words). I thought I might make a Christmas theme tag - but then, since the words didn't really show anyway - I made a fall tag! You can see a little shadow of letters next to the N in NOTEWORTHY and a few other places but it didn't come out the way his did. This was the lightest Alcohol Ink I had - maybe it would have worked better with a lighter ink. I used Alterations Autumn Gathering die for the leaves. Per Tim's technique - you color some gloss card stock with several alcohol inks and then die cut the panels. Then you stamp some of the shapes with a text stamp. I used Remnant Rubs Life Quotes for all the sentiments. I love how this came out even though I wasn't successful with his technique for the background. 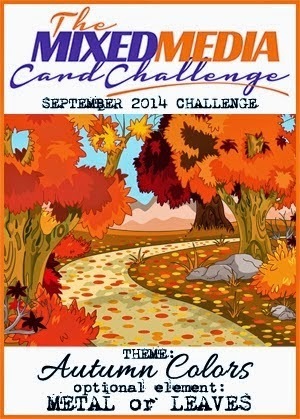 the theme is Autumn Colors. 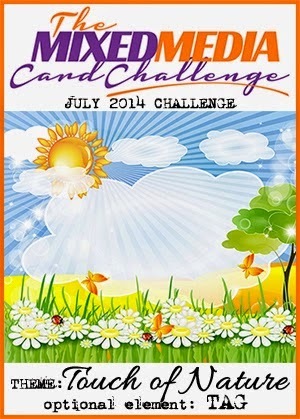 Yikes - I finally found time to work on my Tim Tag for August - with just a couple of days to spare! Here's Tim's Tag and his tutorial on how he made it. This month he wanted us to create showcasing our own creative muse. So although I was inspired by his techniques for the background of the tag - I did use different colors, different stamps, different Idea-ology, and a different theme. Here's my tag. First, like Tim - I laid down two pieces of Tissue Tape - I used Commute. Then I stamped my cool cats from Tim's new set Halftone Halloween over the tape. When I was all done with my tag - the cats didn't show up too well being stamped over the Tissue Tape - so I stamped them again on card stock, but them out, sponged the edges with Walnut Stain Distress Ink and layered them over the stamped cats with foam dots - slightly lower so the stamping behind looks like a shadow. I also used some stamps from Steampunk. The spider is die cut from Alterations Candlelight Fright - that I covered with Clear Rock Candy Crackle Paint. I tucked the spider web into the Tinsel Twine and Natural Trimmings I looped through the hole on the tag. So - I got my tag done! just in time to find out what Tim has to inspire us for the September Tag! 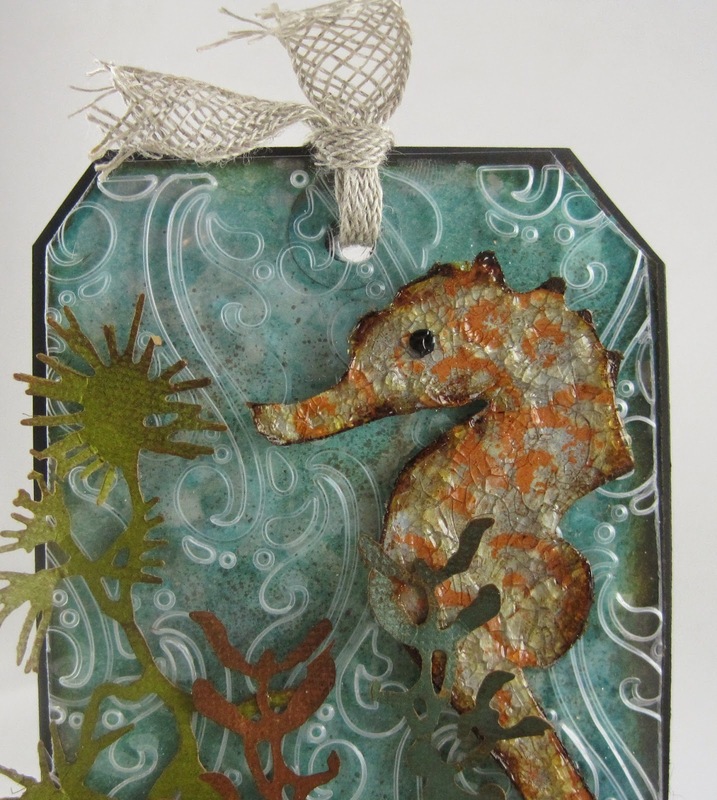 I have a ton of Tim Holtz 'stuff' - but I don't have the main items he used on his tag - so I winged it creating my own slightly different ocean stuff! Here is my tag - can you see all the differences? First off, I didn't have the seahorse/sand dollar die - so I printed a picture of the seahorse and cut it out to use as a template - and then hand cut it out of chipboard. I used different Distress Paint colors to paint her - covering the whole seahorse in Weathered Wood and then just dabbing on Bundled Sage and Rusty Hinge to give a more scaly kind of look. After the ink dried I covered her with Rock Candy Clear Crackle paint. I also did not have the bubbles embossing folder Tim used - so I used the Sizzix Summer Fun folder that looks like ocean waves with bubbles (thank you, Anne Harmon!). I used both Weathered Wood Distress Paint and Salty Ocean Distress Ink on my tag rubbing each on my Nonstick Craft mat - spritzing with water and then running the tag through it. After both colors were on and dried - I spritzed the tag with water. Since I didn't have the sand dollars for the bottom of the tag - I decided to use some real shells that I picked up off the beach on a vacation on Sanibel Island, FL several years ago (I knew I'd use them for something!). I inked them with Versamark and then sprinkled Antique Linen Embossing Powder on them and hit them with my heat tool. I used the Festive Greenery Sizzlet die for the sea plants - using Coredinations Kraft Core paper that I carefully sanded and inked the edges on after die cutting. I stapled the clear embossed panel to the tag with my Tiny Attacher. I added an eye to my little seahorse using Black Enamel Accents. I adhered the plants and seahorse using glossy accents, bending up some of the tips/leaves of the plants for dimension. I always back my tags with a black panel cut a little larger than my tag. I added the Linen ribbon to the top and spread the ends. I covered a Word Band with Weathered Wood Distress paint - then rubbed it off with a towel so the paint just remained inside the letters. I tied the band around my tag with blue Jute String. I needed something else in addition to the shells to put into the fun sand that I made by mixing Utee Clear Embossing powder, Antique Linen Distress Embossing Powder, Antique Linen Distress Glitter and Glossy Accents per Tim's recipe. So I thought a distressed Corked Vial with a note rolled up in it would do the trick! First, I covered the vial with Glue N Seal and let it dry - then I covered it with Rock Candy Clear Crackle Paint. After that dried and crackled - I sponged Adirondack Orange Blossom Ink over it. I added the shells and the bottle to the 'sand' and let it dry. I love how the bottle came out - and look how REAL that sand looks!! How cool! Here is the note I rolled up and placed inside my little vial. I stamped it with Archival Jet Black Ink on Kraft Glassine paper and clear embossed it. I distressed the edges and inked them with Gathered Twigs Distress ink, rolled it up tight and slipped it into the vial - ready for someone walking along the beach to find it!! The sentiment is from the Big Top set. Everytime I see a seahorse - it reminds me of when our Uncle Charlie sent my sister and I two live seahorses in the mail when we were quite young. They were miniature ones and came with a tank and instructions on feeding and care. We called them Hans and Katrina. They were so fun to watch and we thought it was quite exciting to have them. You had to have some pieces of coral in the tank as they had to be able to wrap their tails around something or they would die from constantly swimming. I'm afraid they did not last too long - it was quite hard to keep the salt water regulated properly and very easy to over feed the little things. Our father was quite upset that his brother had sent them to us because he knew what the result would probably be... my sister and I were sad when they 'passed' and we had to have a proper burial out in the backyard. THIS pretty little seahorse will live on forever - I'm happy to say! Are you making Tim's tags each month?? You'll find the challenge here. There's a new one every first day of the month! 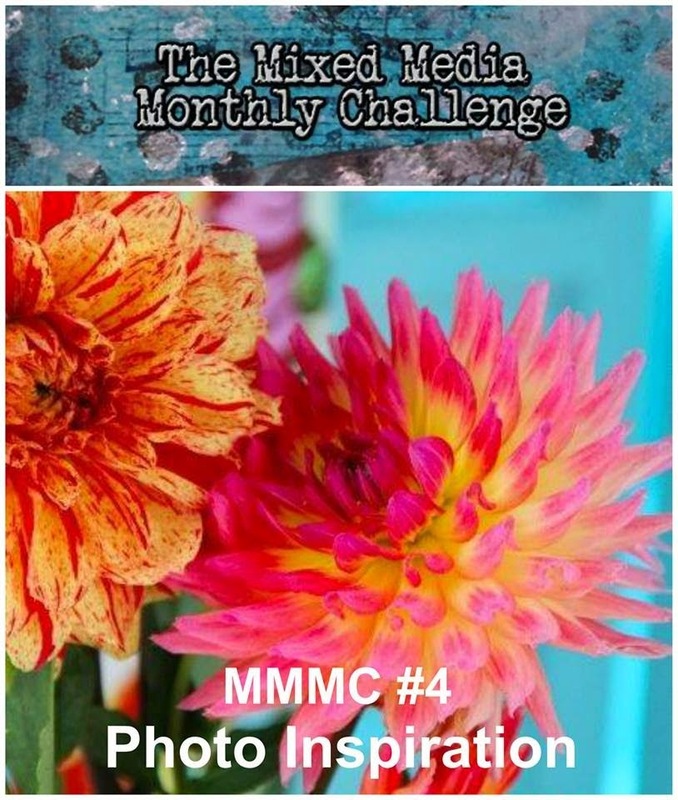 I also posting this over at the Mixed Media Card Challenge this month is Touch of Nature - optional element -Tag - and the challenge is open until 7/25 so you still have time to link a project there! Ink: Ranger Distress - Evergreen Bough, Gathered Twigs, Salty Ocean. Archival Jet Black, Orange Blossom. Accessories: Idea-ology - Sanding Grip, Word Bands, Tiny Attacher, Jute String, Linen Ribbon, Corked Vials; Ranger Distress Stains - Tumbled Glass; Ranger Distress Marker - Frayed Burlap, Sizzlet Festive Greenery die, Black Enamel Accents - Ranger, shells from Beach, Ranger Distress embossing Powder Antique Linen, Ranger Distress Glitter Antique Linen, Black Embossing Powder - Stampendous, palette knife, Ranger Spritz Distresser, Ranger Paper Distresser, Ranger Distress Paint - Weathered Wood, Bundled Sage, Rusty Hinge, Summer Fun Embossing Folder - Sizzix, Utee Clear Embossing Powder, Glossy Accents, Glue N Seal, Clear Rock Candy Distress Crackle Paint - Ranger. 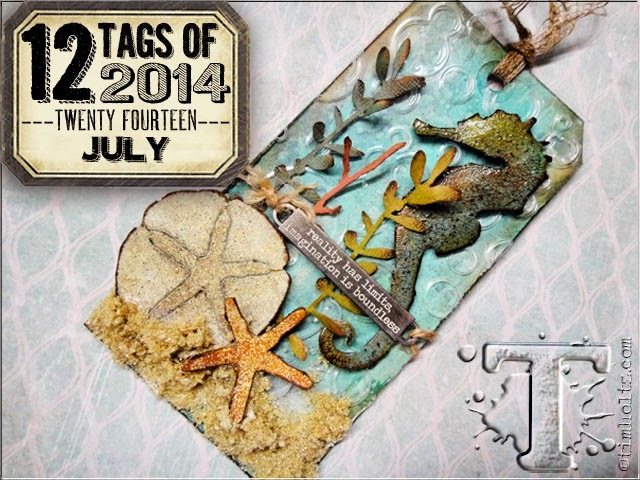 Today I'm sharing my June Tag for Tim Holtz 12 Tags of 2014. You can find Tim's tag here. I didn't have his butterfly stamp set - but I do have the same butterflies in sticker form from the Salvage Stickers/Crowded Attic. They are a shiny sticker in sepia color and I wasn't sure if I could ink over them - but it worked - I just brushed the ink pad over it, rubbed it a bit with my finger to spread the ink out, and heated with my heat tool to help dry it. Each butterfly is adhered with a piece of foam tape along the middle of it's body so they are popped up - and I bent the wings up for some dimension. I added a Vial Label with two Chit Chat Stickers layered on it on the bottom corner. I used the Harlequin stencil with Ranger Distress colors of Mustard Seed, Spiced Marmelade, Peacock Feathers and Picked Raspberry mini ink pads. The technique Tim showed us was to ink the back of the stencil with multi-colors, spritz with water, then press on a watercolor card stock panel, blotting with a paper towel as we pressed the stencil against the panel to absorb the excess watery ink. I laid my stencil on the rough side rather than the smooth side of the watercolor paper - so I think it didn't soak in as much as his did - but I like the look I got so I used it! I love how pretty the Crinkle ribbon came out inking it with the same colors as the Harlequin background. I added some sprocket gears and a game spinner to the top corner and some Remnant Rubs/Botanicals above each butterfly. Are you playing along with his monthly tags? You'll find them all - over at Tim's blog! He chooses several winners each month to receive some Tim/Ranger goodies! I've been at the Stamping/Scrapbooking show at the Exposition Center in Springfield, MA all weekend - working at the Rubbernecker Booth with my stamping buddy, Anne Harmon (jdmommy on Splitcoast). I've scheduled this post to go live before I get home - I'm sure we had a great time - and I'm sure I'm exhausted - just sayin'! So I'm a little behind in my visiting all of your blogs! Hope to catch up tonight! Ink: Ranger Distress - Mustard Seed, Spiced Marmelade, Peacock Feathers, Picked Raspberry, Gathered Twigs. Happy Memorial Day to my friends living in the US. I would like to take a moment to thank all those who serve or have served in the military (including my son) keeping us safe and putting their lives on the line every day they serve. 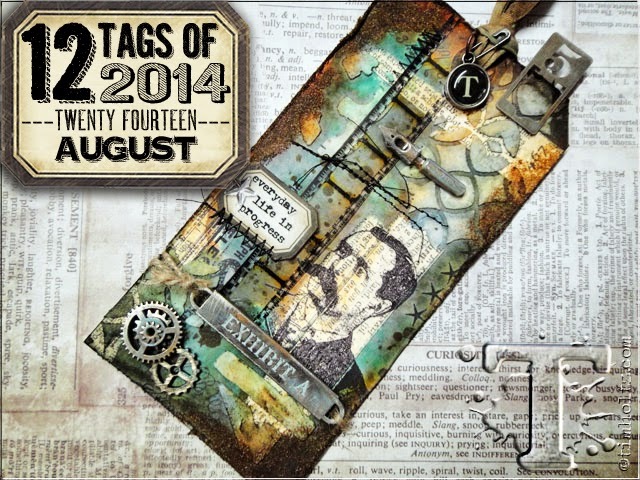 I've been watching the Tim Holtz 12 Tags of 2014 each month and finally decided to join in - better late than never I say! You can see Tim's May tag here. I started my tag by sponging Ranger Distress Fired Brick and Vintage Photo. I flicked water on the tag, blotted the water off and dried it with my heat gun. On the top half, I adhered a Post Card sticker from Salvage Stickers/Crowded Attic, the mini bird and cage die cuts and some Remnant Rubs/Botanical and Life Quotes. Both are mounted on a rectangle of patterned paper and chipboard. I sanded the edges with the Tim Holtz hand sander. On the bottom half I adhered a Heart Charm tied with twine and a panel embossed using part of the Texture Fade Valentine Background and Borders that I inked on the inside with Archival Jet Black Ink. I also added gears cut with the Mini Gears Movers and Shapers set layered with metal mini gears. I drew lines of dots throughout the tag with a Gelly Roll Glaze Pen. I adhered the tag to a slightly larger piece of black card stock, trimmed the corners and looped a piece of Linen Ribbon through the hole at the top - pulling open the ends of the ribbon. The stamp is from Studio 490 Wendy Vecchi Forever Art. I used the Splatters and Measured Stencils. I used the Texture Fades Pocket Watch embossing folder on the Foil Tape Sheet. The graduated hearts stencil was designed by my friend Mona for MFT. The stamp is from Studio 490 Wendy Vecchi - The Beauty of Art - I white embossed it, then scribbled chalk over the black cardstock. Paper: Manilla Tag - Ranger, True Black - Papertrey Ink, DP - Webster's Pages Petite Papers, chip board from stash. Accessories: Ideology - Mini Gears, Linen Ribbon, Remnant Rubs/Botanical and Life Quotes, Heart Charms, Hand Sander, Salvage Stickers/Crowded Attic; Gelly Roll Glaze Pen - Sakura; Alterations - Texture Fade Valentine Background and Borders embossing folder, Movers and Shapers Mini Bird and Cage set and Mini Gears Set. Accessories: Ranger Distress Stain - Frayed Burlap, Splatters and Measured Stencils - Tim Holtz/Ranger, Ideology - Game Spinners, Mini Gears, Gears, Wire Pin, Type Charms, Chit Chat Stickers, Journaling Ticket,Linen Ribbon; Glossy Accents, Movers and Shapers Sized Ovals, Texture Fades Pocket Watches embossing folder - Tim Holtz. Paper: Manilla Tag - Ranger, True Black - PTI, Brushed Silver - SU, Grungeboard heart from Harlequin Elements Ideology. Accessories: Ranger Distress Stain - Tattered Rose, Frayed Burlap, Old Paper; Graduated Hearts Stencil - MFT, Festive Berries Distress Glitter - Ranger, Glue N Seal - Ranger, Ideology - Industrious Stickers/Borders, Remnant Rubs Botanicals and Life Quotes, foam tape, Linen Ribbon - Ranger, Mini Mister - Ranger, heat tool, white chalk, White embossing powder, clear embossing powder.